China and New Zealand will further expand the bilateral trade with signing five cooperation agreements in areas including agriculture, scientific research, quality inspection and quarantine, finance and education Monday in Beijing. 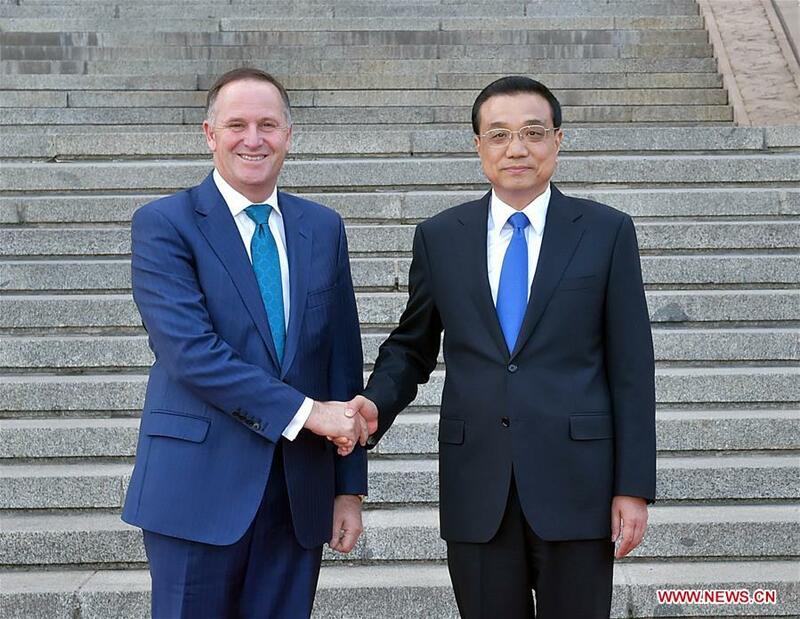 Both sides also agree to promote the negotiation on upgrading their free trade agreement (FTA) which was signed in 2008 after talks between Chinese Premier Li Keqiang and his New Zealand counterpart John Key, who is on his sixth China visit from April 17-22. China is ready to work with New Zealand to give full play to the FTA and create conditions for an early start of upgrading negotiation, Li said. New Zealand was the first developed country to recognize China's full market economy status in 2004 and the first to sign a FTA with China. Bilateral trade has seen double-digit growth over the past eight years, and China became New Zealand's biggest export market in 2014. Li said the fast growing bilateral relations and ever expanding cooperation have ranked China-New Zealand relations among the top of relations with developed countries. Key said New Zealand was willing to further strengthen cooperation with China in agriculture and animal husbandry in the spirit of reciprocity, and actively promote the negotiation on FTA upgrading. Li urged the two countries to strengthen cooperation in the whole industrial chain of agriculture and animal husbandry from investment, scientific research, management to food security, and establish a long-term stable cooperative partnership. He said China will support its entrepreneurs to participate in infrastructure construction programs in New Zealand and welcome New Zealand entrepreneurs to increase investment to China. He called on the two countries to conduct more exchanges in education and tourism, strengthen dialogue and cooperation in legislature and law enforcement, and make closer communication and coordination on international affairs, so as to promote regional economic integration and a sustainable growth of regional and world economy. Key said New Zealand attached high importance to the relations with China, respected China's core interests and supported China to play a role in international affairs. Li also briefed Key on China's current economic situation. He said the economy has seen some improvement recently, the domestic demand such as consumption and investment has seen a faster growth than that of the fourth quarter of last year. The economy is operating within a reasonable range. He said China needs to make more efforts to sustain the momentum of growth, due to the sluggish world economic growth in general, adding China will use policy tools flexibly, foster new drivers to growth and upgrade the traditional ones. The two prime ministers also discussed international and regional issues of common concern. After stay in Beijing, Key will also visit Xi'an and Shanghai. In his first visit to Xi'an, capital of northwest China's Shannxi province, Key would support New Zealand business and cultural links with Xi'an, and visit the city's international trade and logistics hub, part of China's Belt and Road initiative. Key would also help to promote New Zealand's creative industries by attending the launch of the New Zealand Film Festival in Shanghai.